The makers made a special announcement about MERSAL on social media today evening. Vijay’s MERSAL is now the most awaited film in Tamil cinema along with Ajith’s Vivegam. With Vivegam rumoured to be released sometime in August, there is not much information about MERSAL regarding the release date or the trailer release. However, the makers have now made an exciting announcement regarding MERSAL which will make the fans of Thalapathy Vijay an excited group. 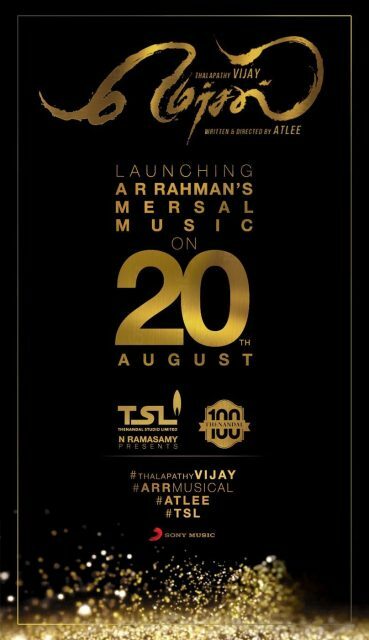 The music album of Vijay’s MERSAL will be launched on August 20th 2017, announced the makers today via social media. The music of MERSAL is being composed by musical genius A.R.Rahman which makes the film more exciting. This wil be third film for Vijay and A.R.Rahman together after Udhaya and Azhagiya Tamizh Magan. Dude, Thalapathy is movie title of Rajnikanth .. not Title given to him.. He is Superstar of Tamil cinema .. Thalaivar of Tamil cinema.. we all know & proud of it.. By d way Vijay Anna’s movie name is Mersal & as Rajni called by Superstar & Thalaivar… Vijay Anna is called Ilayathalapathy & Thalapathy … Hope this clarifies Ur doubt !!! !